Konami Digital Entertainment will release Star Pack: VRAINS for the Yu-Gi-Oh! Trading Card Game on March 30. Star Pack: VRAINS includes popular themes from Yu-Gi-Oh! VRAINS, the sixth Yu-Gi-Oh! anime series that was released after the conclusion of Yu-Gi-Oh! 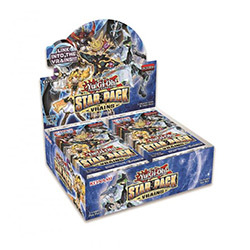 Arc-V. Set in Den City, the series follows high schooler Yusaku Fujiki, and this set includes Cyberse Monsters, Link Monsters and cards from the �Gouki,� �Trickstar,� and �Altergeist� themes like Trickstar Lycouris and Gouki The Great Ogre. The set contains 50 cards, 49 commons, and all 50 cards are available as Starfoils. Each pack contains 3 cards, with 1 guaranteed Starfoil. The SRP on packs is $0.99. This release will follow the release of the Legendary Collection Kaiba boxed set (see �'Legendary Collection Kaiba' Brings Duelist's Favorites to 'Yu-Gi-Oh! TCG'�).